This was a piece of research originally undertaken in 2007 (& subsequently updated) to determine the patterns of the original Victorian cast iron railings in Strathbungo, based on old photographs. While I had intended to focus on the railings on the front steps of houses, with a view to restoring my own, the focus became more on the railings at the street edge, which are mostly no more. Even if you’re not interested in the railings, there are plenty of rare historical photographs. A photograph from 1906 appears in Old Queen’s Park. It clearly shows the design of the railings on the steps, and a different, and much plainer, design on the street boundary. 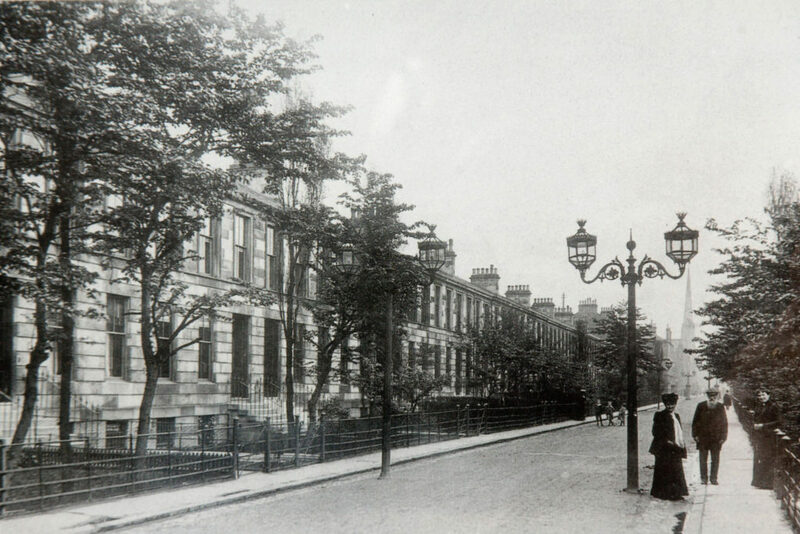 It also shows very ornate double lamp standards which stood in the roadway, and which unsurprisingly are long gone. In the distance one can see four stone gate pillars, the inner posts again in the roadway, and again long gone. Contrary to popular belief, there were no gates, only the posts, and I have been unable to find any evidence to support the existence of gates at the end of the squares. Double lamp standards were placed atop the inner pillars, matching those seen in the foreground. These were reportedly no more by 1933.